From his journey to the United States from his native Dominican Republic at age eleven, to rising above the tough urban challenges of growing up in Providence’s Chad Brown projects, Carlos Gonzalez has always been motivated and inspired by positivity. 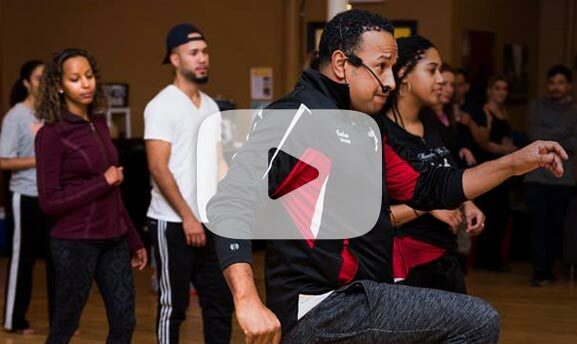 It’s also what fueled him to start salsa dancing in 2004, starting his On2 (or New York style) journey with lessons from Providence based JJ Latin Dancers. Here, he discovered a true passion for Salsa, falling more deeply in love with the dance, the more time he spent with it. In 2009, armed with more training from Anara Frank and Ana and Joel Masacote from Boston, Carlos decided to open his own studio, Mambo Pa Ti (MPT). He saw a demand in Rhode Island, the art capital of the world, to not only promote Latin dance, including Salsa, Mambo, Merengue, Bachata and Afro-Cuban, as a recreational form, but to showcase its artistry. Since then, Carlos has worked hard to do just that, offering workshops to at-risk neighborhood children, training MPT dance teams to perform at community events, as well as showcasing his intricate and innovative choreographies at Salsa Congresses up and down the East Coast, from Boston to New York, DC to Miami and even into international waters on the Aventura Dance Cruise. Yet, at his core, Carlos remains both a dedicated student, passionately continuing his own training with seminars and private lessons from world renown instructors, as well as a committed teacher, patiently sharing his knowledge with students of all levels. And while he’s dedicated to helping each student become the best dancer they can be, his highest accomplishment comes from giving students the confidence and skills needed to take it onto the dance floor and have fun.